Camp N is one of perfect example of why I love living in Manila. 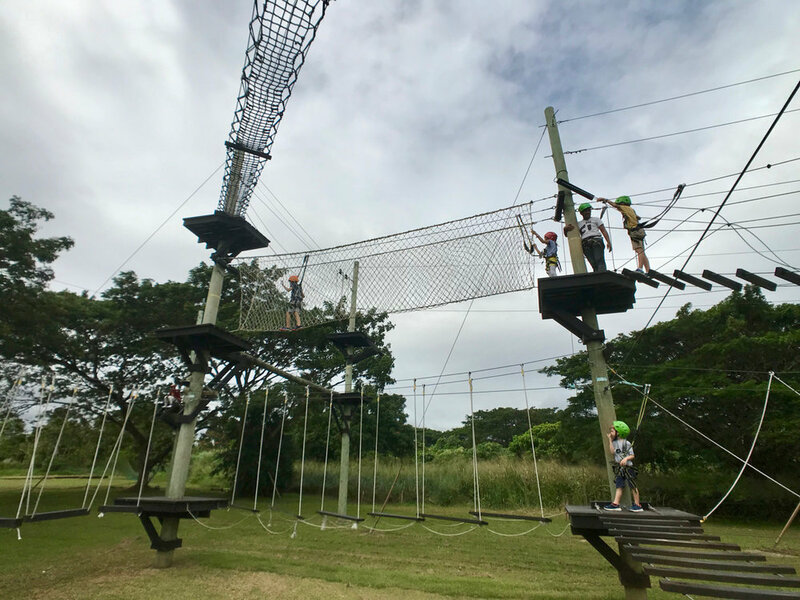 Yes, Camp N is not in Manila but if you leave the heart of the city and drive one short hour south you’ll find yourself on top of a tight rope scaling an outdoor ropes course. Manila and Camp N, I love you. Nuvali gets all they hype these days and for good reasons. Hay-freaking-naku, that place is a dream. Rolling green hills, unobstructed blue skies and a communal man made lake, grabe tone it down Nuvali. Located on the out skirts of the malls and housing developments you will find Camp N sprawling across what seems like 100 hectares! Camp N is the ultimate outdoors active park. The first site you will see as you pull into Camp N is the ropes course. It is a neatly organized and well-made ropes course for children as young as 3 all the way up to adults. You can scale tight ropes, cross wooden steps and climb a rope to a short zip line that will eventually lead you back down to the beginning. The ropes course is very safe, the only change I would prefer is that they give the kids a bit more freedom. The attendants helping the children were overly safe which crowded out some of the independent exploring and fun children should have. For some parents, I imagine they would appreciate the safety, it’s all preference. That’s right a roller coaster and a zip line in ONE! Just like a zip line you will be safely harnessed in but instead of going from point A to point B in a sloping straight line you round the track in a circle all while using your own movement and intertia to power the ride while you bounce up and and down. The day package for Camp N only allows one ride but you can purchase more than one, which I suggest doing as it is so very fun. Located on the side of the roller coaster zip Line is a very tall and narrow outdoor rock climbing wall. This was perfect for the kids who already had their turn doing the roller coaster zip line and were waiting for their friends. It’s nestles on the side of the zip line which was perfect because it shaded the whole time. Unlike the roller coaster zip line, you can climb and repel to your hearts content. The attendants at the zip line and rock climbing wall were remarkable. They were so engaging and fun and really made the experience so enjoyable for all the kids. Camp N is most popular for it’s team building activities and bike courses. Camp N has paved trails all over the property and you can of course take your bike out and ride all around Nuvali. Manila you are fabulous. I quite enjoy living in the city but nothing revives my soul like a fun day in nature. For the price and activities you get at Camp N this is well worth the drive out of the city to spend a day creating memories.